Sometimes the shots you think you will like from a trip fall to the bottom of the pile pretty quickly. A few weeks ago I was out near Pitt Lake hoping for some good sunset alpenglow on Mt. Blandshard (aka the ‘Golden Ears’). Burke Mountain ate up a lot of the direct light when the sun went low in the sky, and clouds obscured the top of the Mt. Blandshard peaks. What resulted was a rather bland panorama. Two years ago I would have been happy with it, but now I know it is a throwaway more or less – not bad but nothing special about it. This was one of those times when suddenly the light just goes away. 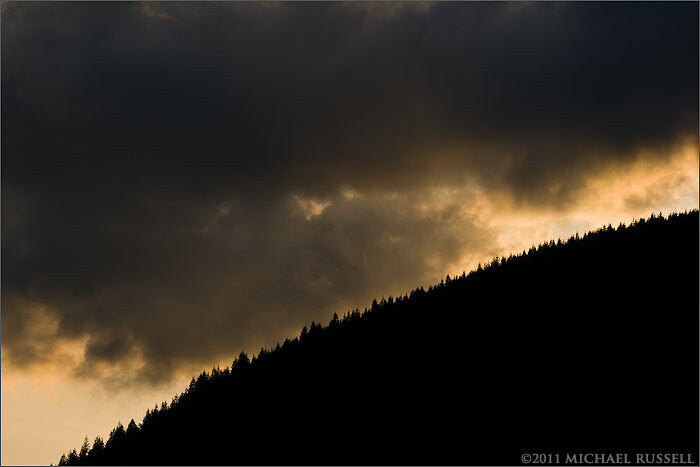 Turning around I saw the scene above – dark clouds with nice orange colours underneath. Thankfully I have just enough zoom in the 70-200 to show the detail of the treetops which I think adds extra dimension to the shot. I have put together some of my favourite images made in the last year into this 11"x17" (28cm x 43cm) nature calendar. Included are 12 photographs of landscape and nature scenes from British Columbia, Québec, Ontario, and Washington State.